From humble beginnings—first as a military post and then as a lumber camp—Ottawa, Ontario, has emerged as a vibrant, multicultural capital city. Ottawa is a bilingual city, reflecting its French and English heritage. Home to the copper-roofed Parliament Buildings, the Supreme Court of Canada and foreign embassies, Bytown, as it was originally named, is also a vigorous community housing farmers markets, world-class museums and historic buildings. 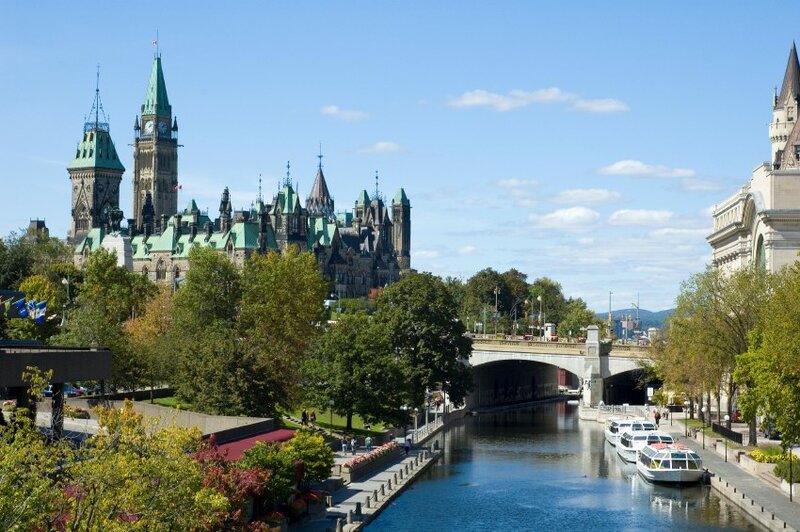 Situated at the confluence of the Ottawa, Gatineau and Rideau rivers, the city is bisected by the Rideau Canal. The section running from Dows Lake to the majestic Ottawa River, a distance of 5 mi/8 km, is flanked by bike and walking paths. In the winter, the ice surface is flooded to create the world's longest skating rink. In the summer, colorful masses of flowers, beginning with tulips in May, bloom along both sides of the canal. UNESCO has declared the entire canal, stretching 125 mi/202 km from Ottawa to Kingston, a World Heritage site. The greenbelt encircling central Ottawa and the many parks filled with plants, well-kept lawns and trees add to the city's scenic appeal. Across the river in Quebec, Gatineau Park is a massive natural playground with some of the region's most pristine protected areas, wildlife, lakes and rivers.